Immediately following the roll call that opened our November Voting Board meeting, I appointed Judy Norton to the position of 2nd Vice President on our board. The position was vacated earlier in the month when Steve Amato sold his home in Highland Lakes, thereby making him ineligible for a position on our Board. Steve was elected to the position of second VP a year ago and did not know at that time that he would be moving. He was a valued member of our Board and I personally want to thank him for his service to our community. He will be missed and we wish him well. When I introduced the appointment of Judy to fill the vacancy for the remainder of Steve’s term (as dictated by the Club’s bylaws), I reviewed for the Board the many volunteer positions she has held since moving here in 1985. Over the years she has been involved in the Ecology Committee and the Communications Committee. Her long history of serving as the trustee for Section 3 began in 1997. During her tenure on the Board, she was a part of the Admin Committee and served as the chairman of the board from 2007 through 2010. In 2016, after vacating her position as trustee, Judy served as the chair of the Nominating Committee for the 2016 election of officers. With all of her involvement in the workings of the Club, I thought her to be the perfect person to take over for Steve. I was heartened when the Board of Trustees, as required by the By-Laws, voted to accept the nomination. Leadership in our community is not something that a person can just step into. It takes time to learn how the community runs and to understand the bylaws and how committees function within the framework of our community. Experience on the committee level and as a trustee positions a person to learn the ropes, so to speak. Judy has done just that and I have no doubt that she will serve our community well in this new capacity. Sincere thanks to her for devoting herself to Highland Lakes as she has all these years. It is rare that people take the time to give a shout-out to all that is good in Highland Lakes. That is why I just have to share these words that came to the members of the Concert Series in an email from Dan Segal, a long-time HL member who was one of the founding fathers of the Open Mic; a past trustee and chairman of the board. He wrote: “I attended the Lisa Loeb concert along with my wife this past Saturday evening. I have to say that we thoroughly enjoyed ourselves…I have not attended an open mic since we officially handed it off to the next generation of volunteers. I have not attended a Seckler Stage show until last Saturday. I have to tell you that I was overwhelmed with pride to see the next generation of “Lakers”. There were families, kids, pregnant women and yes some seniors all there. WHAT A SENSE OF COMMUNITY. The sound was fantastic, the energy warm, and the music was excellent. Thank you again for your service to our community and your efforts to bring us all together. It is noticed and much appreciated. I share his pride in our community, and I know hundreds of others do too. It is a feeling that only comes when you devote yourself to something bigger and join with others to achieve a goal. With the shared effort comes a sense of community and ownership. When life in our bigger world gets to feeling out-of-control and negativity is the norm rather than the exception, it brings me great solace to know I live in a place where we can all come together and enjoy an event that would motivate a person to speak in such glowing terms. The Lisa Loeb show was just one of the great happenings in our community. In recent weeks there has been the Touch-A-Truck (and a helicopter as it turned out); a Halloween dance, a Trunk or Treat and haunted trail; pumpkin carving and a Sunday breakfast at the clubhouse; along with the regular events like the Five and Under Gang that meets on a weekly basis. Attending any one of these events is bound to bring a smile to your face and foster a sense of community. Participating in the planning and execution of it brings a true sense of accomplishment and a feeling that you have done something good. The sense of pride grows with every involvement and when you see others take up the torch, you are as Dan was that Saturday night, and I have been from time to time, overwhelmed with pride to see the next generation of “Lakers”. What a special community we live in. 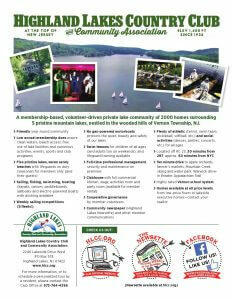 October 1 marks the start of a new fiscal year for our private lake community. Every September the Voting Board grapples with the responsibility of creating a new Operating Budget, requiring the estimation of anticipated revenue and expenses for the coming fiscal year. The process begins with a review of a draft budget which our general manager presents to the Administration Committee earlier in September. Hours are spent in discussion over each line item and items are modified as needed. Once the committee is satisfied that we have a realistic budget that best reflects our vision for the community the budget is brought before the entire Voting Board where further discussion takes place. I’m happy to report that the Voting Board approved the FY 2018 Budget on September 22 and thanks to an increase in our dues-paying members (which translates into our source of revenue), we were able to keep the dues and assessments right where they were in 2017 – $1,285.00 – without reducing services! This was the last Voting Board meeting for two of our trustees who have served our community in this capacity for years. We bid farewell with deep gratitude for the many, many hours of personal time donated by Russ Strube (Trustee for Section 1) and Roy Wherry (Trustee for Section 5). This month we will be welcoming Lou Iannucci (Section 1) and Jim Kensek (Section 5) to the table. Patty Thompson was victorious in the run-off election that took place this month. Congratulations to Patty who will be serving as the Trustee for Section 3 for a three-year term. As you have seen (marveled, perhaps) if you have been anywhere near the Main Lake in the past few weeks, the lake drawdown is well underway. It began on September 15 and is expected to take three to four weeks to achieve the full release of lake water (3 feet) that will enable the Club and lakefront property owners to do some maintenance and repair work on their waterfront. Since mid-July forty three applications for shoreline work were received from lakefront property owners and reviewed by the Club’s environmental consultant, Dr. Stephen Souza, Ph.D. of Princeton Hydro, LLC. Summer, the busiest season in Highland Lakes, is officially behind us. As melancholy as that always makes me, one look out my window reminds me that fall is a beautiful season too…especially in our community. Enjoy the foliage and the fun activities that abound. Thanks to all of our members who gave so much this summer to keep our community vibrant and thriving. We have so much to be thankful for. Before the warm weather slips away, I hope each one of you will take more than a moment to stop everything…inhale this beautiful mountain air; listen to those glorious early morning and evening birds; and bask in the scenic, tranquil beauty that surrounds us. Be mindful in your reflection and recognize that this part of your life is precious and sweet. Happy Day! We are one week away from our Annual Meeting (Sunday, August 20). I’m hoping to begin at 2 pm sharp, but that will only be possible if we have 5 percent of our membership present. Please come with your membership card in hand. The meeting is typically between one and two hours long. It offers all members in good standing the opportunity to catch up on Club business and hear what their neighbors are thinking. Do come on down and join in the fun. Here we are at one of the most anticipated days of the year for our community –Family Day – conceived in 1992 with the first Family Day fireworks in 1998. This annual event seems to draw everyone in Highland Lakes out to enjoy the quintessential simplicity of summer fun and fellowship. Appealing to members of all ages because it is as packed with activity as it is woven through with opportunities to sit down in a beach chair, relax and enjoy laughter and conversation with friends as you take in the view from our Clubhouse lawn. Punctuated by the lighted boat show as the day draws to a close and followed by fireworks that rumble and echo through the mountains encircling our beautiful lake community, it is no wonder that the day holds such a draw. I have to admit that the fireworks are my favorite part of the day. Since they began, I have enjoyed them from a canoe or kayak, and I just love how I can feel the boat reverberate with the sound of each blast and how the mountains echo around me. In the beginning it really felt magical to have so many people out in small crafts under the stars sharing in the drama of it all. I was always struck by how many boaters were actually out there. It was so quiet before the fireworks began and so dark that you just didn’t sense the multitude of boats. Then, when the show illuminated the water, it was an amazing sight to see everyone quietly taking it all in. In recent years though, I’m feeling increasingly wary. With all of the larger boats that are now on the lake, I’m spending more time navigating the waters than I am enjoying the scene. For pontoon boaters, I’ve heard it is equally troubling. More than one pontoon boat owner I’ve spoken to has said you can’t see people in the smaller boats until you are right next to them because they don’t have any lights on their boat. I mention all this simply to say, please be mindful as you take to the water that evening and put safety first. Those in small crafts should have lights on their boats – at the very least a powerful flashlight to alert others to their presence. I’m wondering if pontoon boat captains could throw out an anchor during the show to avoid drifting into others’ space, and if they would consider hanging back a little bit to allow those in smaller crafts an unobstructed view. Whether you are paddling a small craft or operating an electric-powered boat of any size, safe boating at night requires extra vigilance for the safety those around you. It’s a beautiful evening. Let’s, each of us, do our part to assure safe waters and foster the fellowship we’ve all come to enjoy in this place we call home. Our Voting Board workshop this month was quite informative and filled with discussion. It began with a presentation from Mike Gillooley, a past treasurer of the Voting Board who now serves with Brian Morton as co-chair of the Planning Committee. Mike reported that the committee was looking at ways to address properties in our community that were not being properly maintained and offered a number of ideas that he and his committee thought they would pursue. The board sanctioned the committee’s plan and we look forward to an update in coming months. (The Planning Committee meets regularly. If topics like this are of interest to you and/or you have professional experience that would aid us in our attempts to keep our community beautiful and moving forward, call the Club office to find out when the next Planning Committee meeting is and come on down). Discussion of short-term rentals continued from last month’s meeting and ultimately led to a discussion of our By-Laws with regard to the requirement that those who rent their property (regardless of the length of stay) are expected to register the rental (and the identity of those renting) with the Club and pay an Associate Membership fee. Fees are based on duration of the rental: $50 for each week, $100 for each month, and $300 for each year. Once registered, the Associate Member is entitled to purchase badges ($10/badge) which then enables them to use Club facilities. This process helps us to defray the community’s operational costs, but more importantly keeps Club management aware of who is currently residing in our private community. Many members who rent their homes follow this process, but some, regrettably ignore it. At this month’s workshop the board directed the By-Laws Committee to examine ways to amend the By-Law related to Associate Membership so that there would be an automatic and significant penalty if ignored. Other items on the agenda, which will be voted on at the upcoming Voting Board meeting, included mention of the proposal received to evaluate the electrical infrastructure of our clubhouse and the requirements for air conditioning; a proposed survey of Beach 3 in preparation for wetlands investigations and site improvements; and the renaming of the HL Jogathon to pay tribute to Frank Henninger, a dear Club member who died this year. Frank is the person who started the HL Jogathon way back when I was a teenager (in the 1970s). He gave an enormous amount of heart (and time) to this community and anyone who knew him will surely remember him as a kind, gentle, happy, hard-working man who was devoted to his family and Highland Lakes. Our board workshop will be taking place this Monday, July 10 at 8 pm. We’ve changed the normal meeting time (board workshops usually take place on the second Wednesday of each month) because there is a swim meet scheduled at our lanes on July 12. We will be meeting, as we always do, in the Lake Room. This month’s meeting will include a presentation by Mike Gillooley, co-chair of the Planning Committee. Mike has asked to come before the board to share some ideas that his committee has been discussing. As a former officer on the board, Mike is well-aware that he needs board approval before moving forward on any of the items under discussion. We will also be continuing a conversation that began at our board workshop in June following a presentation (given in May) by Nancy Eisenberg who chaired a special committee on the pros and cons of short-term rentals. This discussion has many sides to it and will surely prove interesting. All members in good standing are welcome to attend our meetings. Comments from members are only permitted at the voting board meetings that are typically held on the third Friday of every month. Board workshops offer an opportunity to listen to the discussion by your elected representatives. Those discussions regularly lead to a vote, which can only occur at the Friday meeting. As we start the summer season, I want to give a hearty shout out to a few Club members; two of whom said “yes” when I asked them if they would take on leadership roles that needed to be filled and another who has devoted to our community too many hours to count. My nomination of Pat McNulty to chair the Elections Committee was unanimously approved by the Voting Board at the June meeting. When I asked Pat if he would take on this responsibility, he responded without a moment’s hesitation. “I would be honored,” he said, and by the tone in his voice, I knew he couldn’t be more sincere. Pat moved to our community as a summer resident in 1970 and has lived here year-round since 2004. He has been very active in the Highland Lakes Senior Club, serving as treasurer for over a decade. Barbara Jaggi, a member of our community since 2003, was unanimously approved by the board to serve as our new Ecology Committee Chair. Barbara has been participating in aqua aerobics, knitting and pickleball, has volunteered hours as a badge checker, is a hiker and, in just minutes of conversation with her, anyone could tell she is a lover of the environment and devoted to keeping ours as natural as it can be. I have no doubt that this committee will thrive under her leadership, and I am eager to see it happen. Thank you to these, and all of you who choose to volunteer your time for the betterment of our community. Whether it is an hour of service weekly as a badge checker, a few hours running an activity, or years of devotion; our community would not be what it is without your service. Here we are at the start of another great summer season! Some members of the Voting Board (First VP, Michael Gelfand, Chairman of the Board, Keith McCotter), and General Manager, Jack McLaughlin joined me as I met with committee chairs over breakfast this month. It was great to be in the same room and around one table with so many of the leaders of our community. The morning’s discussion included updates from each chairperson, a review of our communication policy and committee descriptions. The venue also provided me with a chance to say thanks to these leaders, many of whom have volunteered their time in one capacity or another for decades – all for the betterment of our community. It was uplifting. As you pull your boat up to one of our freeway docks, walk on the new clubhouse deck that is soon to be completed, sign your child up for any of the myriad of summer activities available to them, ride on our roads or over our dams, enjoy our lakes, swing to the music at one of our concerts, participate in the many Clubhouse events that will occur this season, even read this Newsette…know that this community would not look or feel or roll the way it does without the leaders that were in the Lake Room with me a few weeks ago and the many, many others in our community who have stepped forward to help in one way or another. PS: Don’t forget our Memorial Day event. It has been heralded in past years as a most moving commemoration and this year the Senior Club will be unveiling its Wall of Honor, a tribute to all who have served.There’s no place, like this place. Enjoy! Readying a community like Highland Lakes for the summer season is no easy feat, which is why our General Manager and staff have been hard at work. New swim lane lines have been ordered and are due in the first week of May. Club docks are in the process of being installed. Playground inspections have been completed and one of the slides replaced under warranty. Badge packets are prepared and awaiting pickup and dock space assignments continue to be managed by the Boat Dock Committee. This year, in addition to all of these regular duties, the staff was also charged with the distribution of a Lake Drawdown Primer that was sent to 220 lakefront property owners on the Main Lake in preparation for the drawdown that is scheduled to occur this September. The Voting Board met on April 21 and was able to move a number of capital improvement projects forward in time for completion for the upcoming summer season as well. The bid on the Clubhouse decking and rail replacement project was approved and work is expected to begin shortly. Steve Hastie is the Special Projects chairman for this construction, and he was on hand at the meeting to answer questions from the board and show board members the materials that would be used. Sincere thanks to Steve for the time he has devoted to the project. After hearing from Tom Buchney, Boat Dock chairperson (another Club member who has devoted countless volunteer hours for the betterment of our community) at the most recent board workshop, the board also increased the budget for the purchase of dock sections, gangways and kayak racks. The following freeways will be receiving new docks: Sunrise Path (2160 Lakeside Drive West at Wiscasset Road), 2100 Lakeside Drive West, and Catfish Path (2060 Lakeside Drive West). Additional dock sections are being added at Comet Row and Beach 4, and kayak racks will be going in at Beach 3. New aeration systems were also approved for the south end and the northeast cove at Glen Road on the Main Lake. Due to be installed by mid-June, these systems will improve water flow, curtail lake stratification and help to oxygenate the lake more evenly at these locations. All of these factors improve lake quality. At the upcoming Voting Board Meeting in May, we will be welcoming town council members from Vernon who will be speaking about matters of interest to our lake community. The meeting is scheduled to take place on May 19 at 8 pm. Please join us if your schedule permits. If you have been keeping up with the news that is being shared in this Newsette and on our website, you are aware that our plans are to lower the Main Lake by three feet in September. Much of the discussion at the March Voting Board workshop revolved around this project and how we will be communicating the specifics with Club members, especially lakefront property owners on the Main Lake and the boating community who will be directly impacted by the project. In two weeks or so lakefront owners will receive a Lake Drawdown Primer that will provide guidance about NJ Department of Environmental Protection regulations and the permitting process related to repairs to lakefront walls and other activities that, in some respects, are quite complicated. The primer will be accompanied by a letter that carefully and succinctly provides the facts that you need to know. Princeton Hydro, LLC has been retained to assist lakefront owners in determining whether a planned project requires NJDEP approval. It is anticipated that most projects will require only Club approvals. The Main Lake Drawdown Project will begin on or about September 15, 2017. Lakefront property owners on the Main Lake who normally remove their boats and docks from the lake should plan to do that no later than September 15. Any docks or boats left in after this date are at risk of being damaged and stuck in place until the following spring due to the low water level. Other members who store their boats on Club docks must plan to remove their boats by Monday, September 4, 2017, as the Club must remove the docks for storage before the lake begins to be lowered. Boats remaining on Club docks after that date are subject to removal and storage in accordance with Club rules in effect at that time. The full drawdown (that is 3 feet) is expected to be completed by September 30. Before you do any work on your shoreline you must consult with the Club to make sure the work is permitted and to find out if you need special permits from the NJ DEP. The permitting process takes time so members are encouraged to get started on the process as soon as possible. The Main Lake must be allowed to fill naturally beginning January 1, 2018, and is expected to return to its normal level by June 1, 2018. In addition to receiving this written material, lakefront property owners and all Club members are encouraged to attend an informational meeting with Princeton Hydro (the Club’s water quality experts) that will be scheduled within the next few months. Our Voting Board workshops are held on the second Wednesday of each month and they are the perfect place to be if you want to learn about the current issues that the Voting Board is discussing. Our February workshop was particularly interesting because two of our committee chairs provided the board with updates on committee activities. Tom Mulcahy, chairperson of the Road Committee, talked about the speed hump program and the proposed locations where new speed humps may be installed. The proposed locations reflect requests received from members and input from Club management, Security and Maintenance staff. The next step in the process is an inspection and evaluation of these locations by Gary Dean, P.E. of Dolan & Dean Consulting Engineers, the Club’s traffic engineer. Sight limitations, hills, curves and intersections on a road often make an otherwise worthy location (a place where neighbors suffer from speeding vehicles past their homes) an unacceptable place for a speed hump. Tom also reported that the three bridges in our community (two on Island Road near the peninsula and one on Island Drive at the southern part of the Main Lake near Beach 4) were evaluated by Boswell Engineering and found to be in good condition, though the roadways approaching those bridges are in serious need of repair due to significant erosion of their embankments. The Voting Board authorized Boswell to guide us through the next step by developing plans for stabilizing the embankments and to submit the appropriate permits to NJDEP. Our schedule is to conduct this work in the fall when the lake is drawn down. Tom Buchney, chairperson for the Boat Dock Committee, shared information about the remaining dock that was needed at the Shadow Lane Freeway and discussed his committee’s plans to evaluate the boat launch area at Beach 2, and the use of freeway docks by members. A discussion of how we might best convey to Club members the importance of removing all boats from docks on the Main Lake prior to the anticipated Lake Drawdown Project followed. The Lake Drawdown Project, as you might imagine, is a significant undertaking and one that the Voting Board has been anticipating for a number of years now. Due to take place in the fall of 2017, this project will enable lakefront property owners to make limited repairs to their waterfront walls and will provide the Club with the opportunity to repair its property, including the three bridges, its major docking areas, and the boat launch area, among others. This past month the Voting Board received a draft of the Lake Drawdown Primer which, when finalized, will be distributed by mail to all lakefront property owners on the Main Lake. We will also schedule a meeting to answer questions about the project before it begins. This month’s Voting Board workshop is on March 8. Meetings start at 8 pm. Topics to be discussed are usually posted to our website the day prior to our meeting. At its January meeting, the Highland Lakes Voting Board formally appointed a special committee to examine rentals of properties and compliance issues as they relate to the Club’s Associate Membership By-Laws. This committee is comprised of trustees and officers, as well as members of the Planning Committee and By-Laws and Rules Committee and includes Steve Amato, Ellen Buchney, Len Bogdon, Lisa Entwistle, Michael Gillooley, Brian Morton and Martha Lewin. The chairperson pro tem is Nancy Eisenberg. Thank you to all for your willingness to volunteer as you do. We are looking forward to hearing your comments and recommendations at the April workshop. The Voting Board also allocated funds for new lane lines for the swim lanes and approved a three-year contract, subject to attorney review, for our lake management program. As you may have heard, our Club is intending to lower the Main Lake this coming fall and plans are well underway now to see that we accomplish this goal. Once a plan is in place, property owners living around the Main Lake will be notified of the plan and encouraged to attend a meeting that will be scheduled with authorities on the subject who will be able to answer any questions they may have. At its March meeting the Ecology Committee will be welcoming Dr. Steven Sousa, Ph.D. of Princeton Hydro, LLC who will be presenting information about our lake management program. Members are encouraged to attend this meeting to learn about the many factors that are considered as we strive to keep our lakes beautiful. At our upcoming February workshop, scheduled for February 8 at 8 pm, we’ll be welcoming Tom Buchney, chairperson of the Boat Dock Committee and Tom Mulcahy, chairperson of the Roads Committee. Both are coming to share details of the work being performed by their respective committees. A full calendar of Voting Board meetings can be found on our website. Meetings rarely go longer than two hours (usually one-and-a-half) and are very informative. Member comments are welcome at the Voting Board meetings (on Friday nights) but are not permitted at the Wednesday workshops. Workshops are structured to enable a full discussion between board members on the issues on the agenda that will then be voted on at the following Friday night Voting Board meeting. We do our best to post to our website the topics that will be discussed at each meeting the day before the meeting takes place. At its meeting on November 18, the Highland Lakes Voting Board moved forward on a number of issues that were fully discussed at the board workshop earlier in the month. Most months the board workshop is scheduled to occur on the second Wednesday and board meetings, where all of the voting takes place, are held on the third Friday. Members are welcome at both meetings. If you want to know how your community is being managed and how the issues of the day are grappled with, I encourage you to join us. (For a full schedule go to //hlcc.org/members-information/governance/voting-board-meeting-schedule/). Among the items approved by the Voting Board in November was a set of communication guidelines which will be distributed to all committee chairpersons, activity chairs and board members. The purpose of these guidelines is to encourage all to use our board meetings as the place to discuss matters of concern; to use Club communication channels (the Newsette, www.hlcc.org and //www.facebook.com/HighlandLakesNJ/ ) when promoting Club activities and events; and to refrain from using other forms of media unassociated with our Club without reviewing this first with the Club manager. The Voting Board also resolved to form a special committee composed of representatives from the Planning Committee, Rules and By-Laws Committee and Voting Board to examine property rentals and compliance with the Club’s Associate Membership By-Laws, with a special focus on short-term rentals such as those being conducted by owners directly or indirectly through companies such as AirBNB, HomeAway, VRBO, etc. In past months, the Voting Board voted to have an engineer evaluate the overall electrical and lighting systems in the clubhouse. This month, the scope of the evaluation was expanded to include an assessment of air conditioning requirements in the older sections of the clubhouse as part of the overall evaluation. The Board of Trustees also accepted my nomination of Michael Gillooley and Brian Morton to serve as co-chairs of the Planning Committee and Sam Lewin to serve as the chair of the Buildings and Grounds Committee. I wish to acknowledge and sincerely thank Lyn Kaplan for her years of dedicated service to our community as the Planning Committee chairperson and Steve Amato for his involvement as past chairperson of the Buildings and Grounds Committee. Our Club would not thrive as it does without the dedicated involvement of all of those who volunteer. Although committee and board leadership is bound to change with time, we stand upon the shoulders of all those who came before us and lay the groundwork for all who will follow. As I sat at October’s board meeting and listened to Trustee Bill Beardsley report on the work of the Clubhouse Committee I was, as I often am, impressed by how much that committee does for our community. Between the breakfasts and the seasonal celebrations like the Trunk or Treat that took place on October 29, followed by the Craft Fair coming November 5, followed by the 80th Anniversary Dance on November 12, etc., etc. 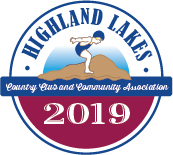 – You get the picture…Highland Lakes just wouldn’t be the place that it is without this committee and all of the others. In addition to hearing about activities organized by the Clubhouse Committee, this month we learned that the permitting was in place for the lakes to be stocked (a task that the Fishing Committee handles annually), and we discussed how many hits the new HL flyer created by Tom Dolle of the Communications Committee received after being posted to our website. To ensure close coordination and communication between the voting board and committees, each officer and trustee is asked to serve on at least one committee in addition to their work on the board. The time spent in these committee meetings enables board members to provide the voting board with monthly updates on committee work during a portion of the meeting devoted specifically to this. Additionally, this year we will be inviting each committee chairperson to meet with the board during a workshop to discuss their committee’s work and interests. In most cases the people who are active on committees have been involved for years. Their love for our community is strong, their devotion has made Highland Lakes the place that it is today and their knowledge of how things work is invaluable. To keep our community thriving, new members with new ideas and expertise are needed on all committees. A blend of veteran knowledge and new blood will only make Highland Lakes more vibrant. To learn more about committee work and the role you could play in building our future go to our website, hover over the Member Info tab on the home page and click on Committee Descriptions and Meeting Calendar. There you will find the name and phone number of the committee chairperson. Sub-pages in that same section offer a description of the committee’s focus. Choose one that interests you and come join us. The start of October brings a fresh fiscal year and a new board takes charge. We welcome two new trustees, Dominic Beninati from Section 8 and Len Bogdon from Section 12 and say sincere thanks to outgoing trustees, Jana Randazzo and Brian Morton for their years of service to the Club. Ray Zimmerman, who served as trustee in Section 6 for one year, now begins his first, full three-year term and Keith McCotter continues into a second term as trustee for Section 7. Steve Amato, former trustee from Section 4, will be joining us as 2nd Vice President. Bob Hughes, our illustrious president for the past three years, will take on the role of treasurer as we bid fond farewell to outgoing treasurer, Mike Gillooley. Michael Gelfand assumes the office of 1st Vice President; Ellen Buchney continues on as our secretary, and I find myself sitting in the president’s chair. To find a complete list of officers and trustees go to //hlcc.org/members-information/voting-board/. Members of the board, just like so many people at the lake are avid volunteers. At Adult Appreciation Night this year, we honored over 300 adults of all ages and interests. The room was filled with friendships forged over swim meets, ball fields, tennis courts, committee meetings, clubhouse events, badge checking, goodwill fundraising, art shows, concerts and board meetings. 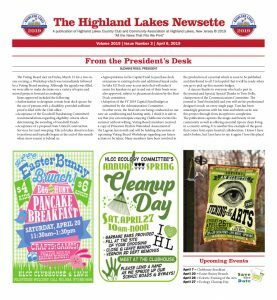 The sense of personal pride and ownership of all that is good in Highland Lakes was palpable at this celebration just as it is at so many lake events. Our Club depends upon its volunteers. Their commitment makes our activity program robust and diverse. The heart that powers volunteer involvement connects us to each other and fosters community. Some people, by nature, are reluctant to volunteer. Whether it is shyness that stops them, a fear of overextending themselves in an already busy life, or a simple lack of vision as to what they might be able to offer, they simply cannot bring themselves to walk into it alone. I contend that they need to be invited in and encourage our hearty cast of 300 to act as ambassadors this year. The next time you are headed to the activity/committee/event that you have chosen to devote yourself to, stop and think about who you might bring along and then call, text or email them with a “Why don’t you join me? It’ll be fun.” Our community will be the better for it and so will they.